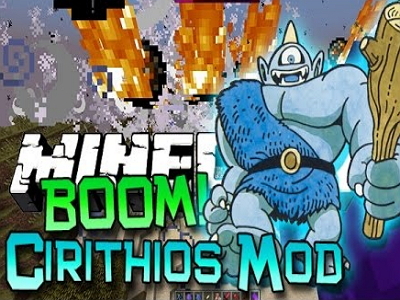 While there are many mods for Minecraft, each of which greatly expand upon what can be done within the game, the Cirithios Mod for Minecraft adds several new monsters, crafting recipes, and two new methods of crafting items. New Mobs: Warriors, Mummies, Flame Skeleton, Ancient, Cyclops, Relic, Pentoculus, and Glacius. Notably, the crafting field for the Fabricator adds three blocks along each of the four sides. Magic Rings: These can be crafted with the Ring Fabricator. While you can create Iron and Gold Rings, they only serve as the base item needed to make the magic rings. * Water-Breathing: Survive underwater 50 seconds. * Lightning: Use this to spend one blood vial and summon lightning up to 200 squares away. * Healing: Spends blood vials to give 50 seconds of health regeneration.